With Summer in full swing and a daughter that was growing and learning quickly (though out-of-school for nearly three months), we figured that we needed to do a road trip to experience the world in ways that are simply not possible in a classroom setting let alone being stuck at home. 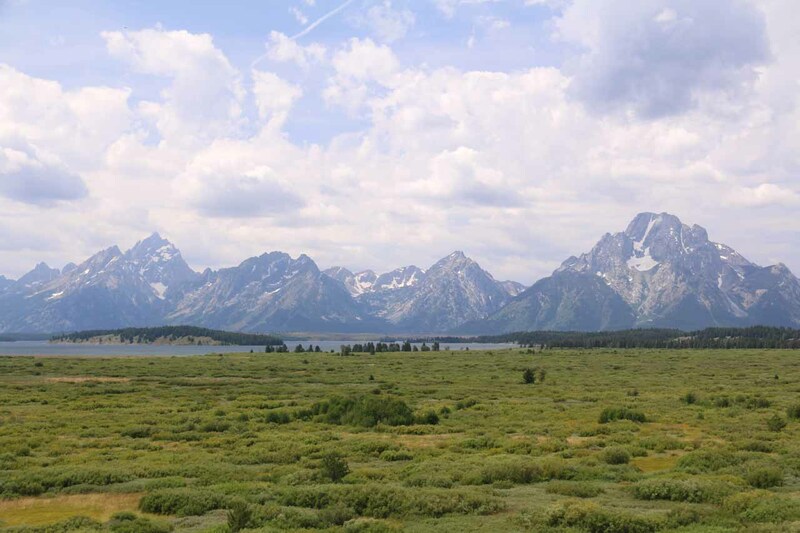 With a bit of planning, we managed to take her to places like Glacier, Yellowstone, and the Grand Tetons. 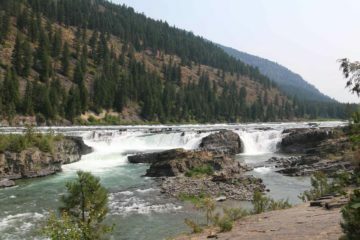 We also took her across the border into Canada, and we spent a few days visiting friends and families who lived out-of-space (in Washington and Idaho). 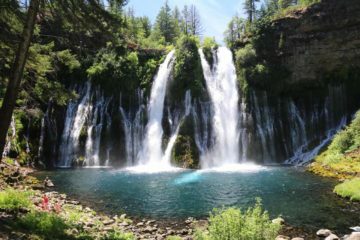 Burney Falls – we took a detour near Redding while making the long two-day drive from Los Angeles to Seattle so that Julie and Tahia could finally get to experience one of California’s best waterfalls. 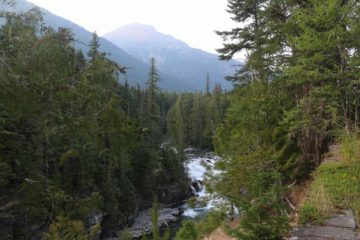 Sea to Sky Highway – this famous drive that connected Vancouver to Whistler featured at least three major waterfalls (Brandywine Falls, Alexander Falls, and Shannon Falls, among others) as well as the mountain resort of Whistler. Butchart Gardens – this was probably the most famous attraction on Vancouver Island, and it was certainly priced that way. 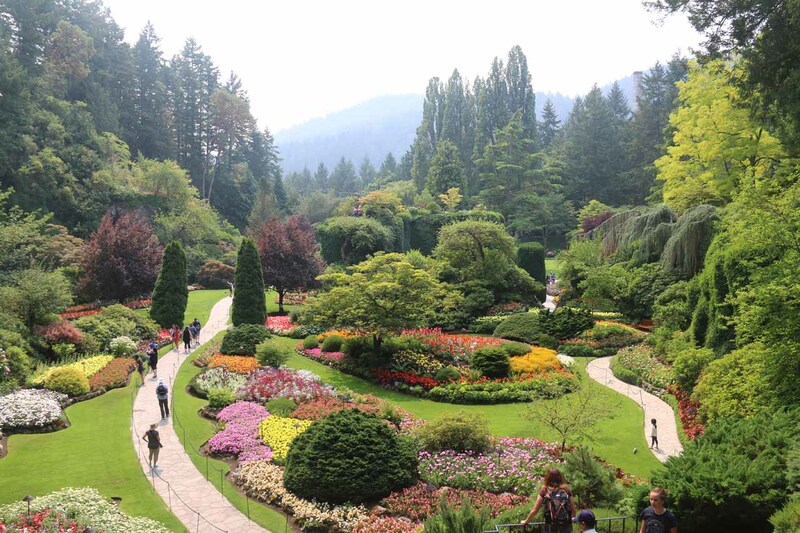 But once we got into the massive garden complex, we could see why. There were colorful exotic flowers of all types all over the premises, and it could easily take a whole day just to really get to experience this vast garden. Fisherman’s Wharf – this was one of the more unique and colourful attractions of Victoria though we had to walk quite a bit from the famous Inner Harbour to get there. 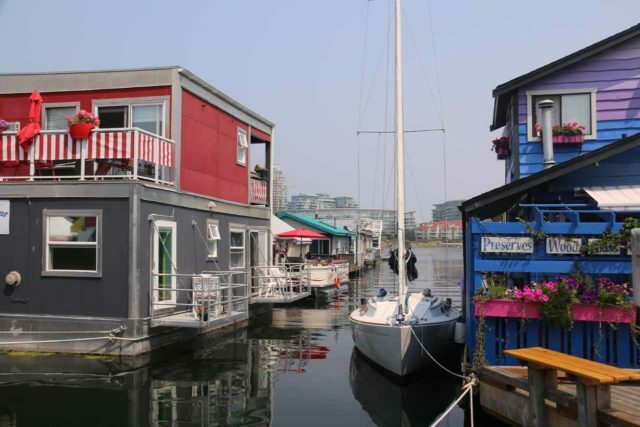 The attraction here was the rows of colourful floating homes as well as some fresh seafood lunch shacks on the same dock. Inner Harbour of Victoria – this was the focal point of anyone visiting or staying in the city of Victoria. 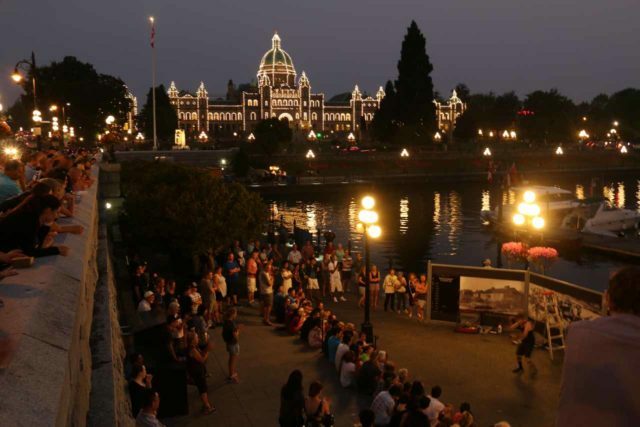 We first experienced the magic of this central part of the island’s capital on a cruise stopover. So we made it a point to spend a couple of nights here the next time around to really experience this place. Surrounded by Victorian buildings (like the Parliament Building and the Empress Hotel), this place really came to life in the twilight hours and the evening. 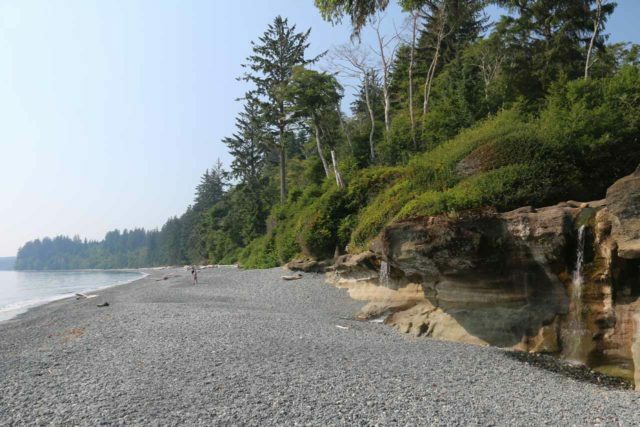 Sandcut Beach – this was one of a handful of the quiet and magical beaches on Vancouver Island’s southern coast. 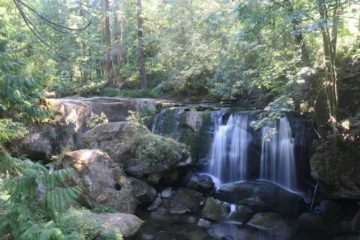 While there were more people in the busier city of Victoria, it was serene and beautiful at Sandcut Beach, and it even had a small waterfall to boot! 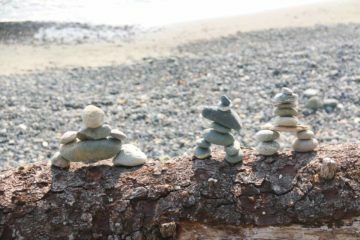 The calm tidal waters of the Strait of Juan de Fuca also made it a welcoming place for our daughter to play in the pebble beach. 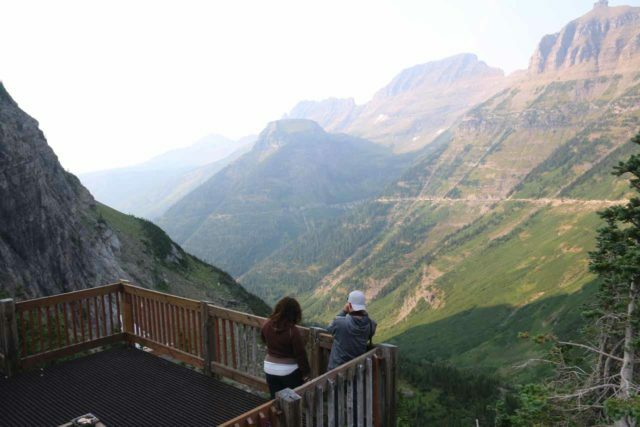 Going-to-the-Sun Road – this was Glacier National Park’s famous road that cut right through the scenic heart of the reserve. 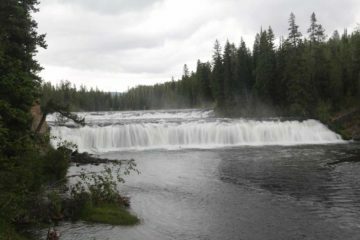 There were numerous vistas along the way as well as the chance to see wildlife like goats, moose, and even grizzly bears! Indeed, it really felt like we were on top of the continent as we were soaking in the experience. 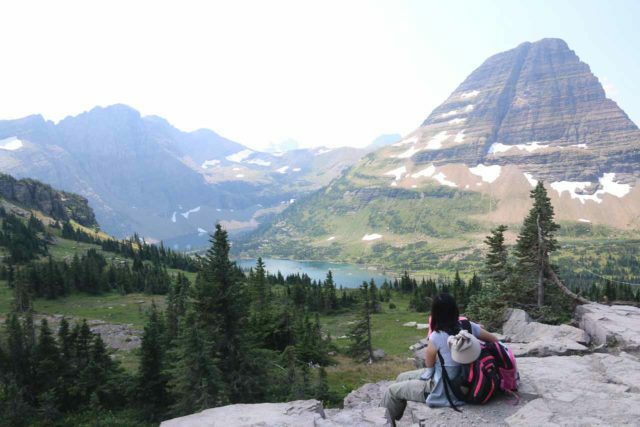 Hidden Lake – this was the signature hike of the Logan Pass area of the Going-to-the-Sun Road. 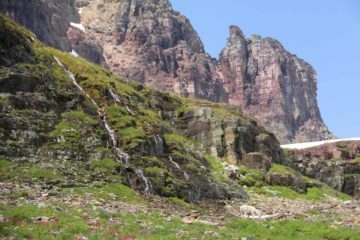 While this glacial lake vista was the main attraction of the hike, there were also beautiful mountains flanking the trail along with blooming mats of wildflowers, mountain goats blending in with the snow, cascades, and other mindblowing vistas along the way! 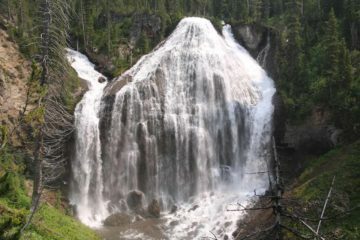 Virginia Falls and St Mary Falls – this was probably the best waterfall hike along the Going-to-the-Sun Road as it passed by the pleasant multi-tiered St Mary Falls (which also doubled as a bit of a cliff diving and swimming spot during our visit) then alongside some attractive unnamed cascades before finally arriving at the beautiful Virginia Falls. 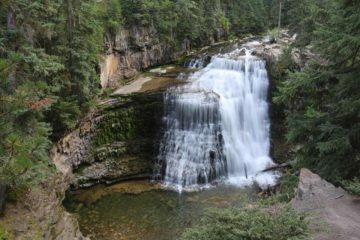 While it took a bit of work to fully experience this hike’s nearly 4-mile round trip distance, that didn’t impact this place’s popularity one bit! 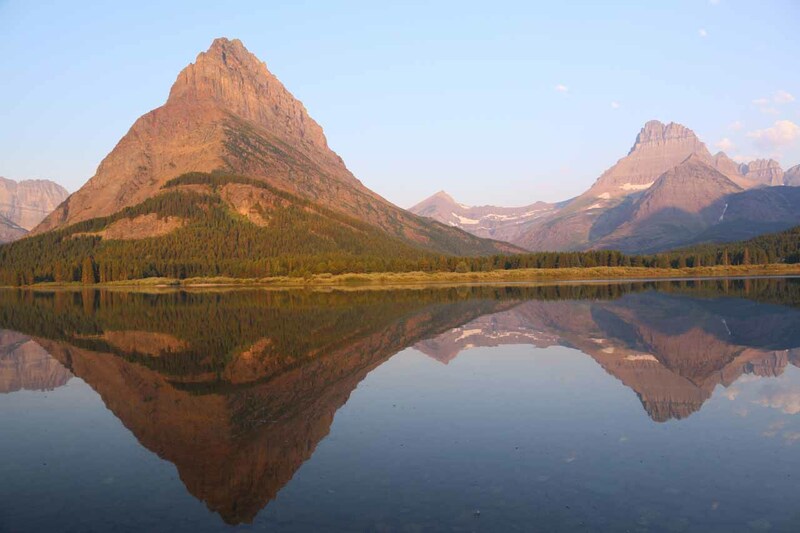 Many Glacier Hotel and Swiftcurrent Lake – we spent pretty much the entire day visiting the scenic Many Glacier Valley, where Swiftcurrent Lake reflected shapely peaks as seen from the historical Many Glacier Hotel. We even went on some boat cruises to get a different perspective of the immediate area while also shortening the much longer Grinnell Glacier hike. 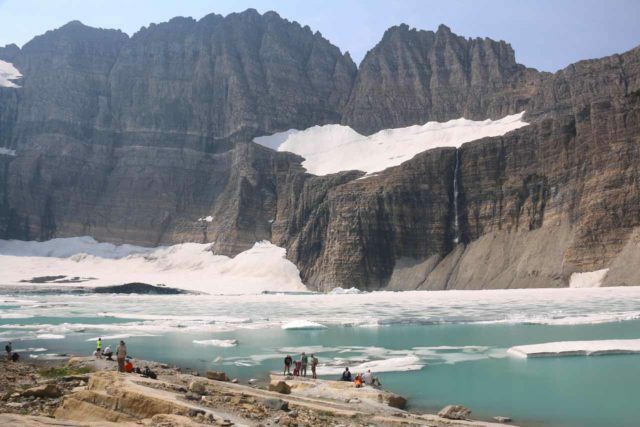 Grinnell Glacier – this taxing full-day hike was also the signature hike of the Many Glacier Valley. 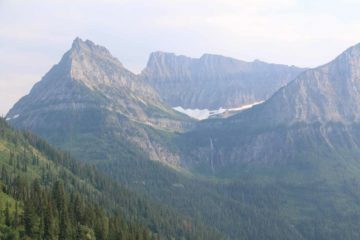 In addition to seeing the impressive cascade of the Grinnell Falls while also experiencing Swiftcurrent Lake and Lake Josephine, it ultimately terminated at what’s left of the Grinnell Glacier with the Upper Grinnell Lake and icebergs floating within while being surrounded by the cirque of wrinkly mountains exposed by the powerful forces of the glacier itself when it was more substantial. 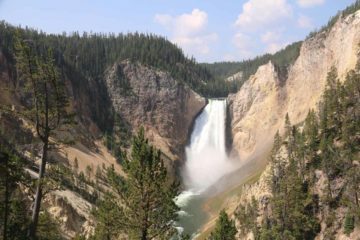 Yellowstone’s Wildlife – while on this trip, we’ve managed to have a moose and grizzly sighting (well, for Julie and Tahia in the latter case) in Glacier, but there’s something very special about checking out wildlife in America’s Serengeti. It was so magical that our daughter cherished her bison stuffed animal after seeing several of them live in Hayden Valley. 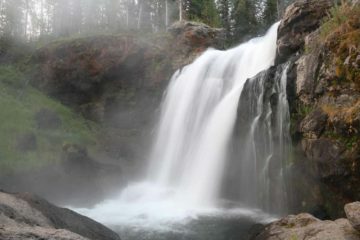 Indeed, such moments are why we live for Nature! 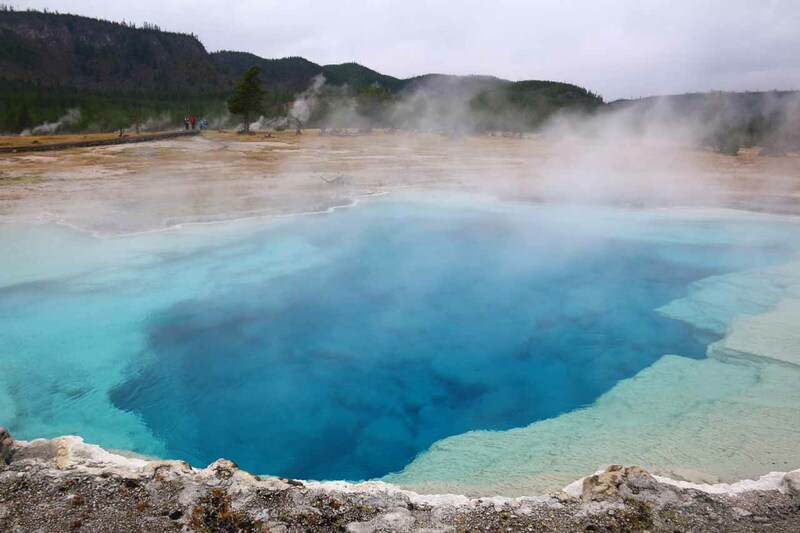 Upper Geyser Basin – while Old Faithful Geyser was the most famous predictable geyser in Yellowstone’s Upper Geyser Basin, it’s very worth checking out the other thermal pools (e.g. Morning Glory Pool) and predictable geysers (like Fairy, Grand, Riverside, and more). 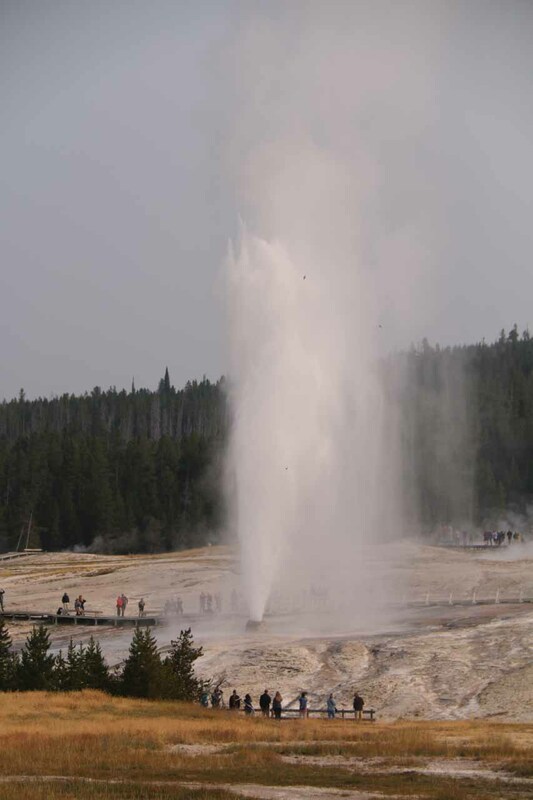 We were even fortunate enough to have seen the infrequent Beehive Geyser go off, and it pretty much stole the show! Indeed, who knows what other surprises are in store in Yellowstone’s geothermal wonderland? 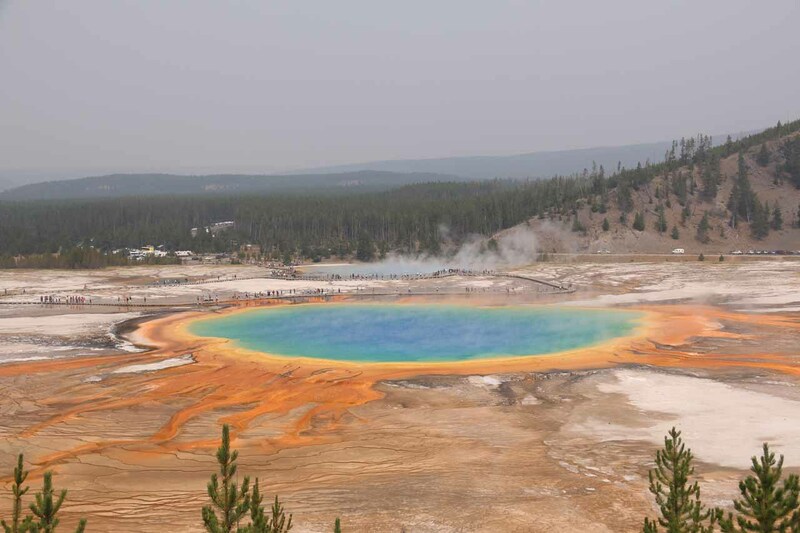 Grand Prismatic Spring – this contextual view of the largest spring in Yellowstone National Park recently had a makeover and sanctioned trail branching off from the Fairy Fall hike. 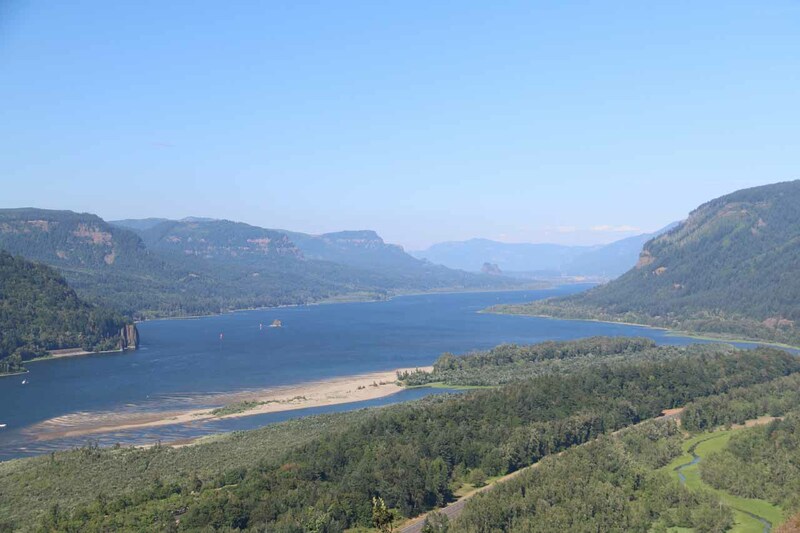 When we first came here 13 years prior, we went on one of the “social” trails to get this view, and we wondered if its inclusion on our website might have eventually led to the newly-built trail to control the erosion and impact as this view became popular over the years. 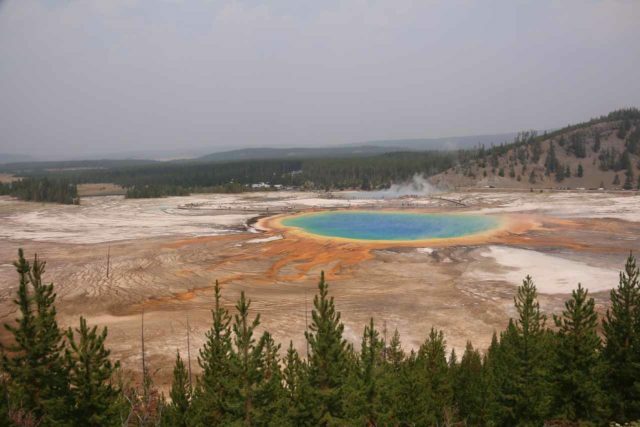 Of course, don’t forget to continue the hike to the waterfall, especially since most people don’t continue past the Grand Prismatic Spring Overlook. 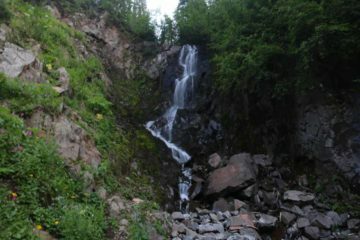 So it was a peaceful hike as most of the crowds were left behind. 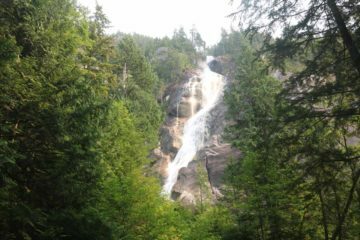 Union Falls – after a failed hike 13 years prior to this trip due to the Fall River running too high, this waterfall had haunted me over the years until I finally got my second chance. With a good deal of planning and risk management, Julie and Tahia were doing a guided tour of Yellowstone’s more known sites along the Grand Loop Roads. Meanwhile I took a full day to do this nearly 16-mile hike while meeting fellow hikers along the way. 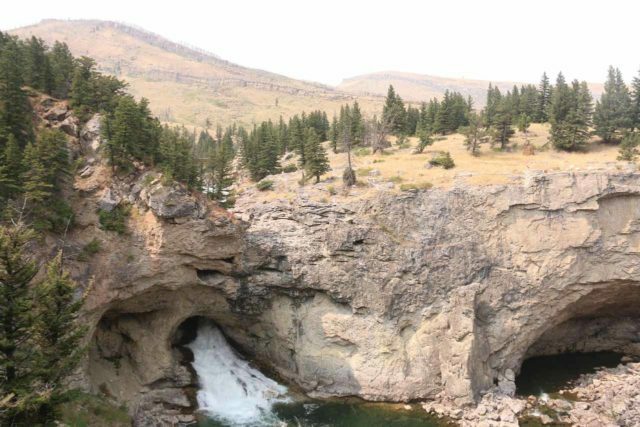 This hike also included a lukewarm geothermally heated waterfall at the Ousel Pool, and it was most certainly one of the most unforgettable hikes I had ever done as a result! 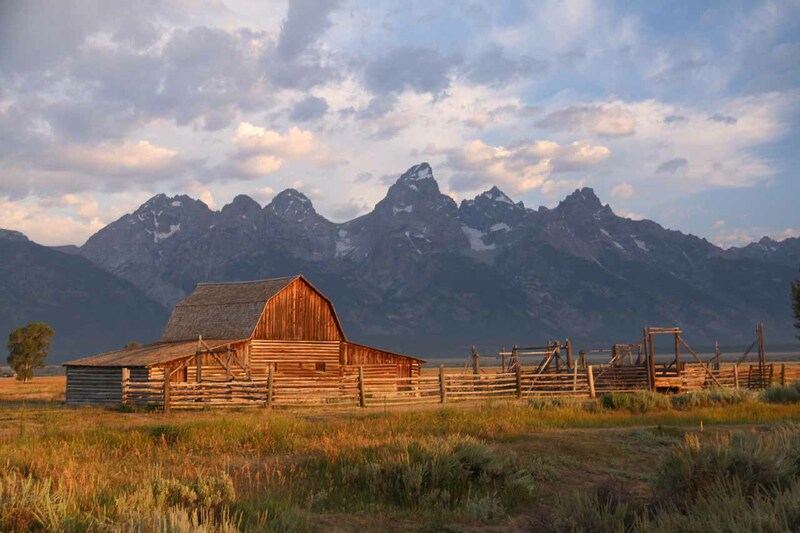 Mormon Row – these were the signature barns that were favorite photo subjects to the Grand Teton Range being lit by the earliest light of the day. 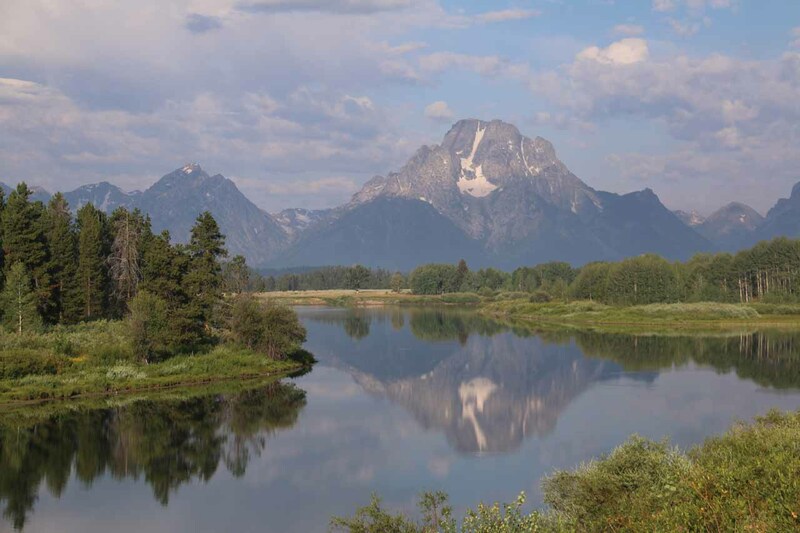 While the storm clouds weren’t cooperating on the morning that I was here to try to get my postcard photo, it was still a magical experience while also giving me a head start on the day to check out the rest of the Teton Range vistas in early morning light. Oxbow Bend and the Grand Teton Overlooks – this was one of the signature photo spots to view the Grand Teton Range, and in this case, the majestic Mt Moran was reflected in the Snake River in one of the perfect early morning photo spots in Grand Teton National Park. 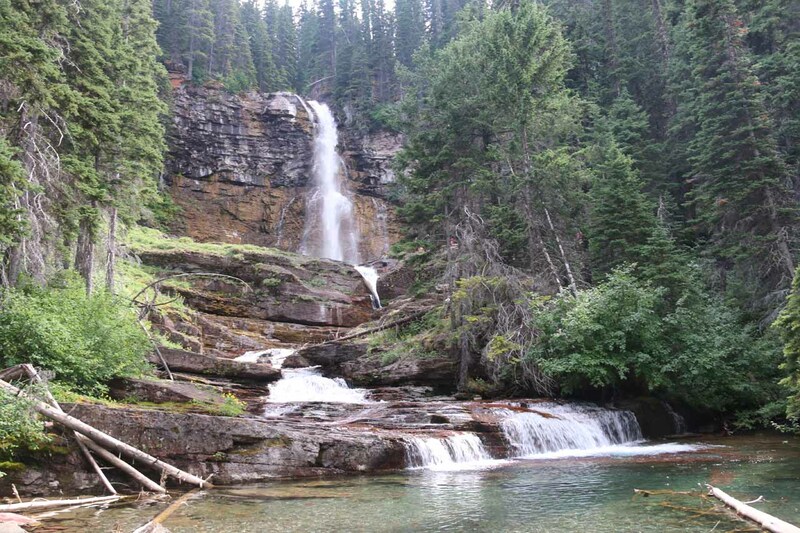 Terraced Falls and the Cascade Creek Waterfalls – while the sanctioned view of Terraced Falls was a little on the disappointing side, I was pleasantly surprised at the waterfalls that I wasn’t even aware was there on Cascade Creek when I started off on the hike. 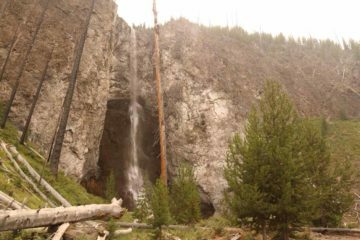 But there they were when I sought them out, and it culminated in the largest one of the lot which turned out to be nearby the trailhead itself (as shown above). 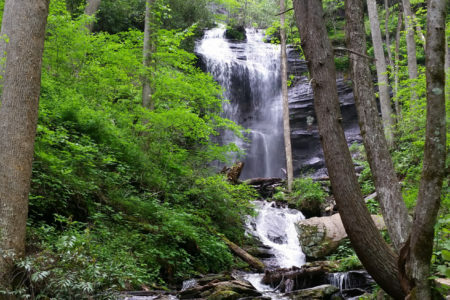 It’s surprises like this that made this experience so memorable, and I can’t wait to return to finally see Terraced Falls from the other side of the Fall River! 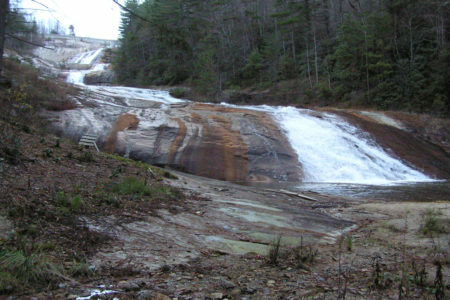 Biscuit Basin, Mystic Falls, and the Biscuit Basin Overlook – during a morning thunderstorm, I had mistakenly done a longer hike out to the Biscuit Basin Overlook, then descended to the scenic Mystic Falls, before rejoining Julie and Tahia at the Biscuit Basin where the weather calmed down and the geothermal basin was once again its colorful self making for a wonderful experience that took place before the crowds really started to show up. 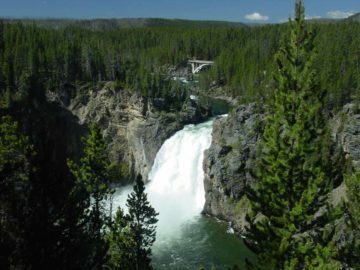 Cave Falls – this was Yellowstone’s Cascade Corner’s other signature waterfall, and it also turned out to be the park’s widest. 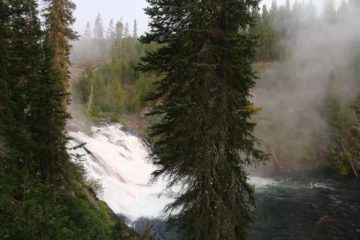 We actually managed to fit our visit in before a real mean thunderstorm that dropped hail on us as we drove back out to Idaho and eventually to Idaho Falls to end off our very memorable last day in Yellowstone National Park. 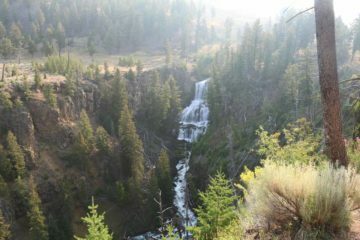 Fall Creek Falls – this was the last waterfall we saw in Idaho before we made the long drive to visit friends in Boise, and then start our final leg of the trip in Oregon the day after. But we definitely capped off this Rocky Mountains part of the trip in style as it was one of the more unique waterfalls seen on this trip. 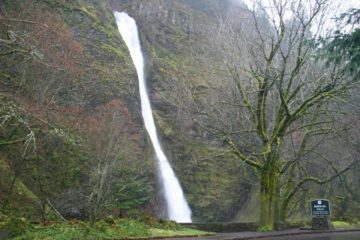 Multnomah Falls and the Columbia River Gorge – while this wasn’t the first time we visited this iconic Oregonian waterfall, it was the first time I went all the way up to the top for a very different experience. 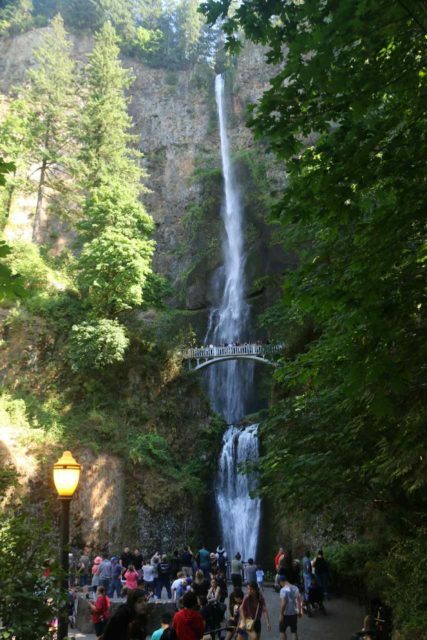 Of course, we also took this opportunity to visit the Horsetail Falls and Latourell Falls as well as the Vista House on our way back to downtown Portland. 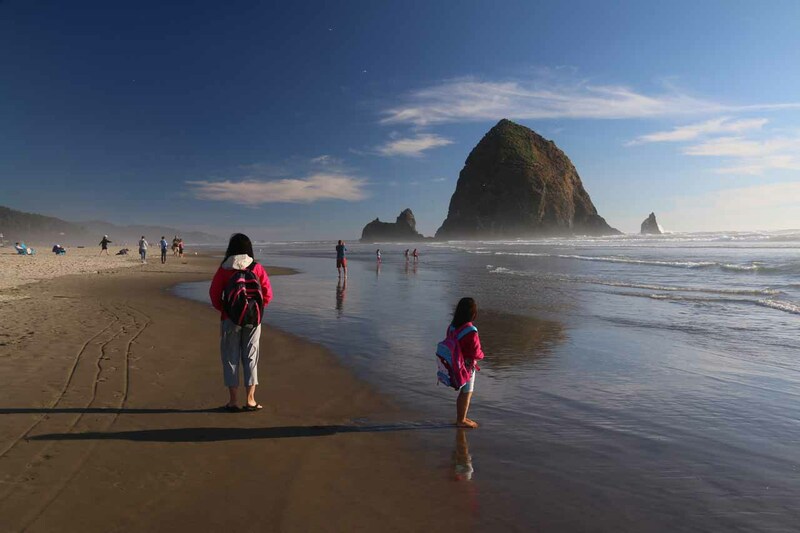 Cannon Beach – Julie, Tahia, and I made it all the way out to this scenic beach after getting a bit of a late start, but that allowed us to experience the late afternoon glow of the setting sun while also splurging on a dinner in town before making the drive back to Portland. Julie and I always had a fondness for the Oregon Coast, and this time we finally got to share it with Tahia! 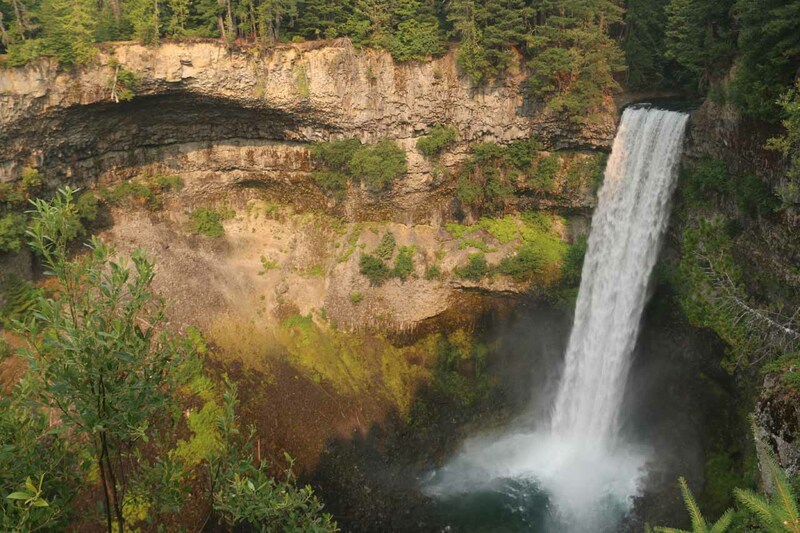 Tamanawas Falls and Panorama Point Park – after finally getting to visit the block-shaped Tamanawas Falls, on the way back to the Columbia River Gorge, I stumbled upon this memorable viewpoint for perhaps my best views of Mt Hood on a beautiful morning. It further proved to me that “the early bird gets the worm” as my Mom would always say. 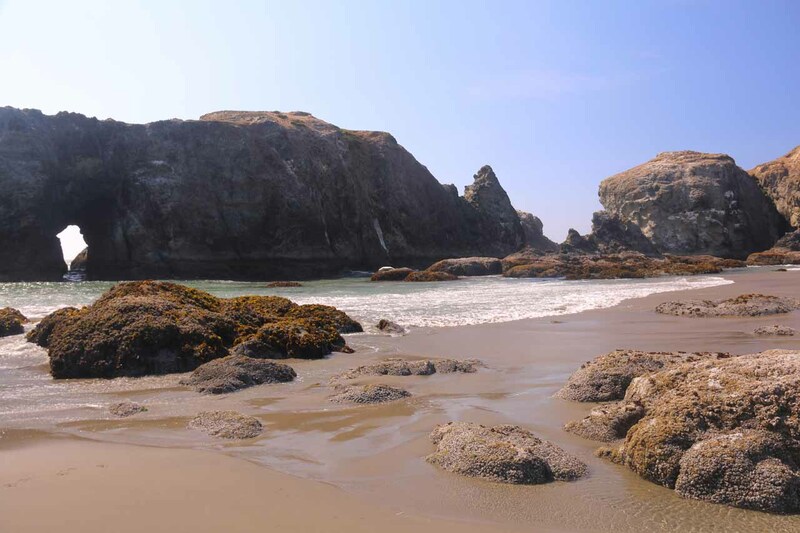 Bandon Beach – we made a scenic detour along the Oregon Coast that culminated in a memorable visit to the familiar Bandon Beach. 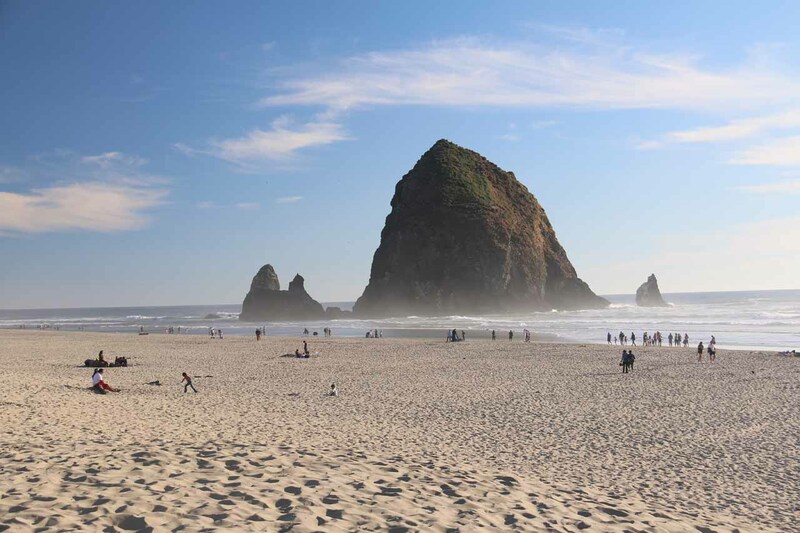 This time, we managed to get a sea lion sighting, a sea arch, and beautiful rock stacks all on the same visit! It’s amazing how places like this always produces magical moments, and this was the last of the scenic sights of our epic Summer Road Trip to the Pacific Northwest! 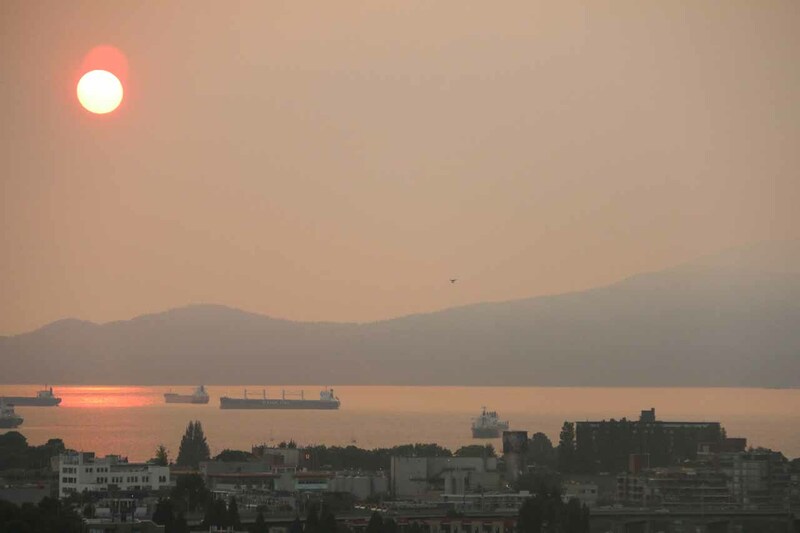 Fire Season: In recent years with Global Warming, it appears that there’s now fire season in addition to extreme heat. 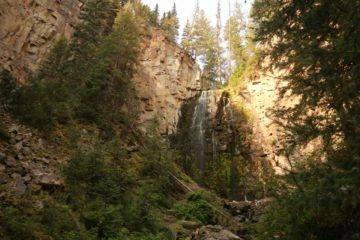 On a hike to Union Falls, I chatted with some Montana natives who lamented that there used to not be wildfires happening so frequently. So she dubbed it “Fire Season” when there used to not be such a thing when she was growing up. On our trip, most of the days were above 90F and even some exceeding 100F. 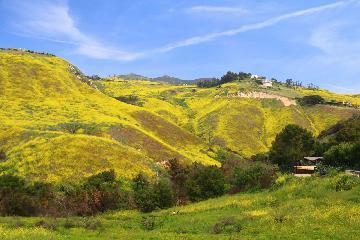 These were ripe conditions for wildfires. 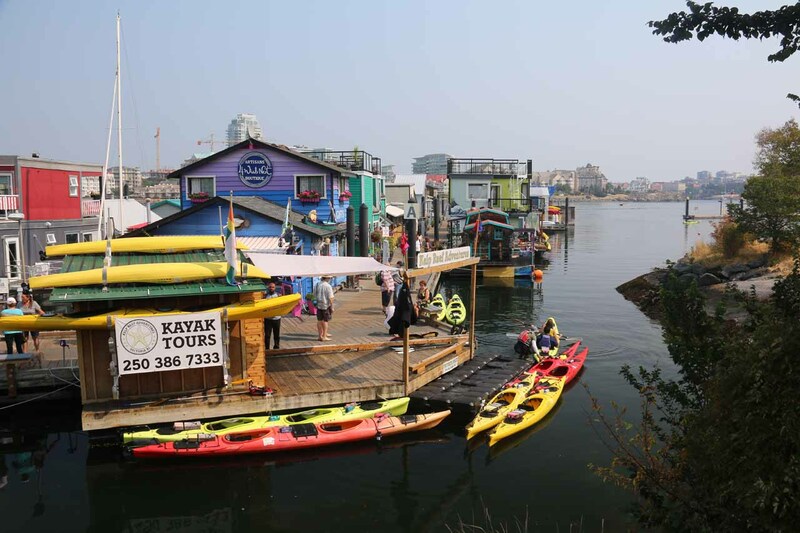 We were definitely affected by the severity of the wildfires in British Columbia where they went through their worst fire season in their history to date. 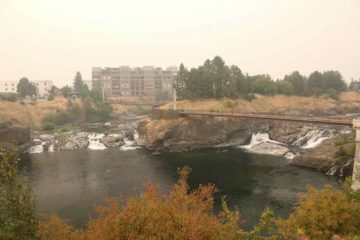 We also were affected from the smoke and haze resulting from new fires that also sprouted up in Montana and Oregon. This resulted in really bad air quality as well as closures. I guess that’s now the risk reward tradeoff. 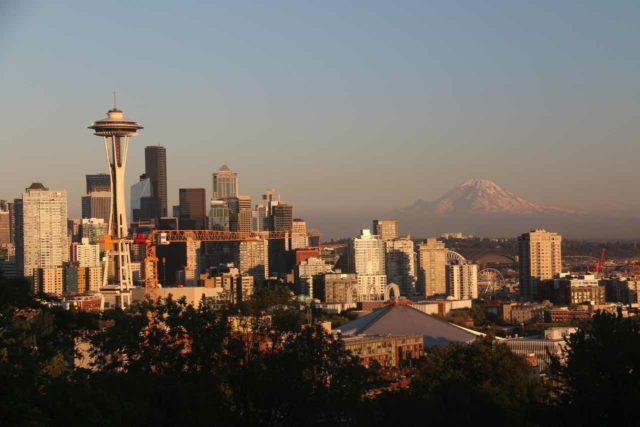 There’s typically better weather in the Summer, but also means the increased likelihood of out-of-control wildfires. Peak season Since this was right around the time that the kids were out of school, it also meant that many families were taking their vacations. As a result, the high demand meant higher prices at accommodations and restaurants (even prone to being booked solid without advanced reservations). 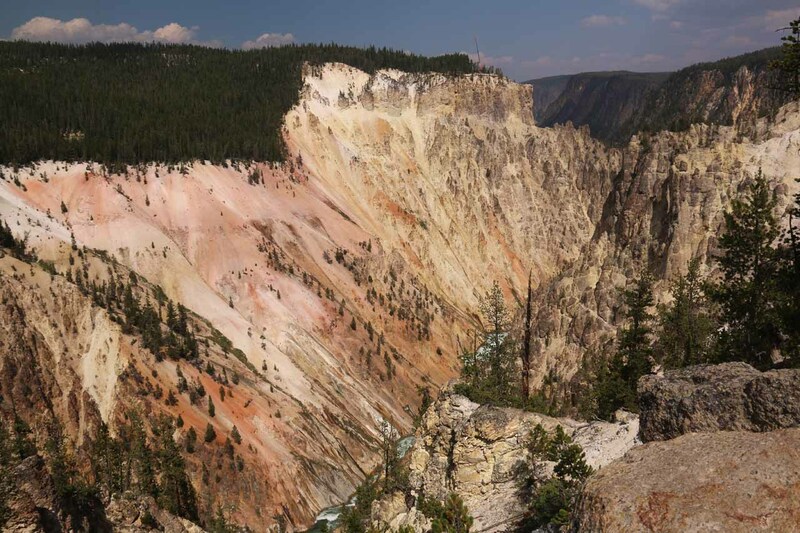 There were also crowds just about everywhere we went, and that was manifested in some intense parking situations, especially in Yellowstone, Grand Teton, and in Glacier. 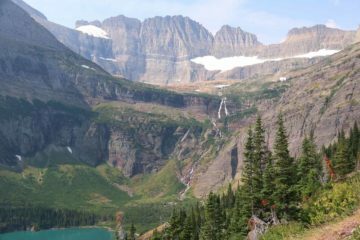 In the case of Glacier National Park, their free shuttle service was inadequate (think being denied boarding full shuttles two or three times in a row after waiting at least 30 minutes for each shuttle). 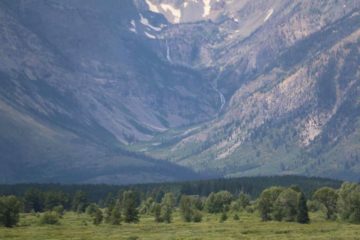 Meanwhile in Yellowstone, it’s almost like winning the lottery as drivers would look for people walking away from the trailhead thinking they’re leaving. It’s definitely not stress-free holidaying to say the least. 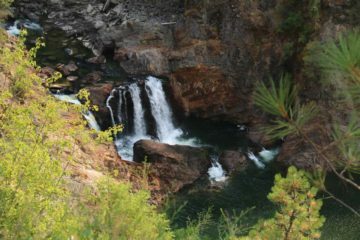 We broke up the long drive by stopping over at Redding. 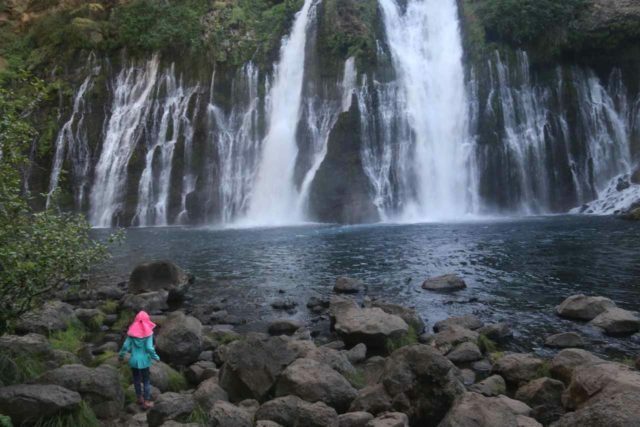 Before checking in, we made an out-and-back detour to Burney Falls. This was another long day of driving. 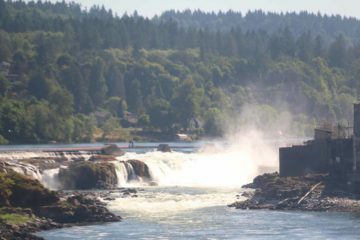 To break up this drive, we stopped over at Willamette Falls in the southeastern suburbs of Portland before finishing off the drive. 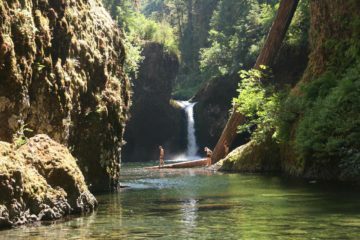 Julie and Tahia got to hang out with their cousins while I did a morning hike to Wallace Falls. 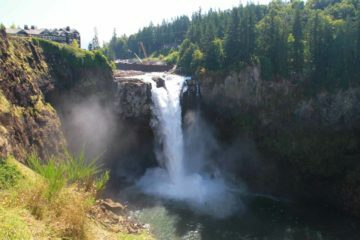 We spent the afternoon visiting Snoqualmie Falls before hanging out together for dinner and chilling on the shores of Lake Washington. 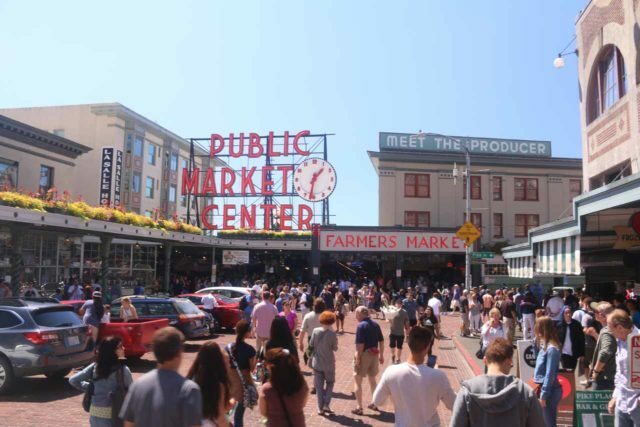 After a quick morning hike to Twin Falls, we hung out together in downtown Seattle taking in the Pike’s Public Market, the harbor front, Kerry Park, and Lake Union. 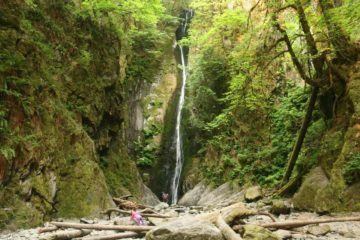 We broke up the drive to the US-Canada border by checking out Whatcom Falls before eventually making it to our accommodation in Vancouver. 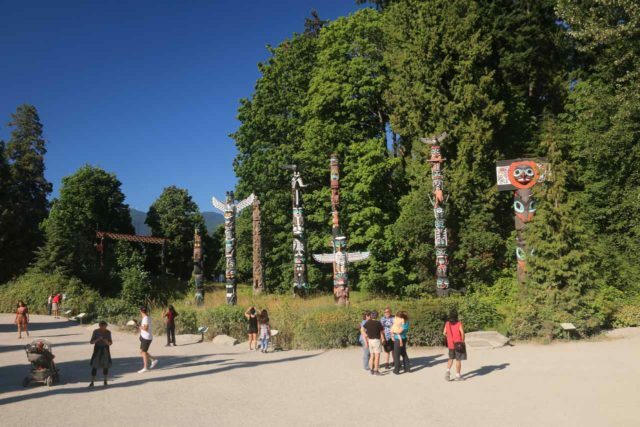 We had the rest of the day to enjoy self-tour Vancouver, and we spent that time visiting Granville Island as well as a last-minute hop-on-hop-off bus taking in Stanley Park, where we walked a small stretch of the Sea Wall towards the very popular totem poles. We did a day trip driving from Vancouver to Whistler and back. The wildfires throughout British Columbia affected the visibility and air quality of this visit so we didn’t spend as much time in Whistler as we would have liked. 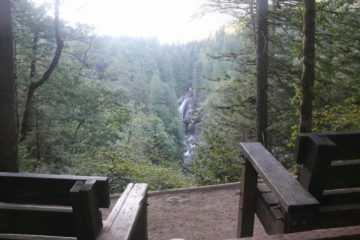 That said, we did get nice experiences of Brandywine Falls, Alexander Falls, and Shannon Falls. 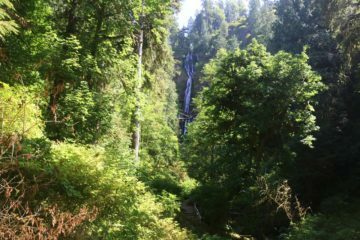 After getting a pre-dawn start to catch our scheduled ferry to Vancouver Island, we then visited the Goldstream Niagara Falls before spending the rest of the morning visiting the Butchart Gardens. 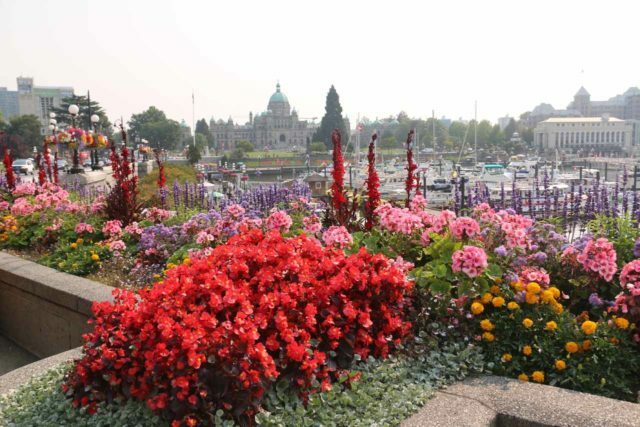 Afterwards, we then spent the remainder of the day visiting the Inner Harbour of Victoria. 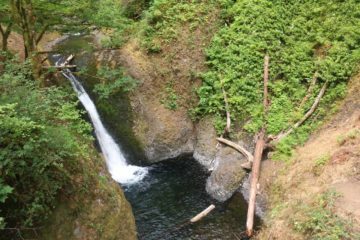 I started off the day with an early hike to the Goldstream Falls before spending the better part of the late morning and early afternoon visiting the Parliament Building and the Fisherman’s Wharf in Victoria. 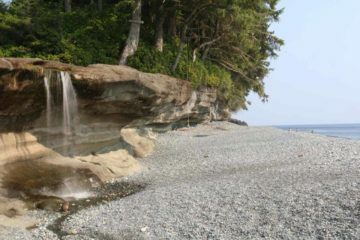 We then spent most of the afternoon visiting Sandcut Beach and its waterfall before returning to Victoria for one last night on the town. 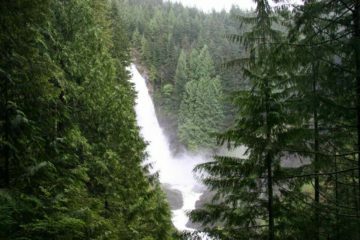 This was a very long day of driving further exacerbated by the lengthy border crossing that took at least an hour despite our earliest possible departure from Vancouver Island back to the mainland. 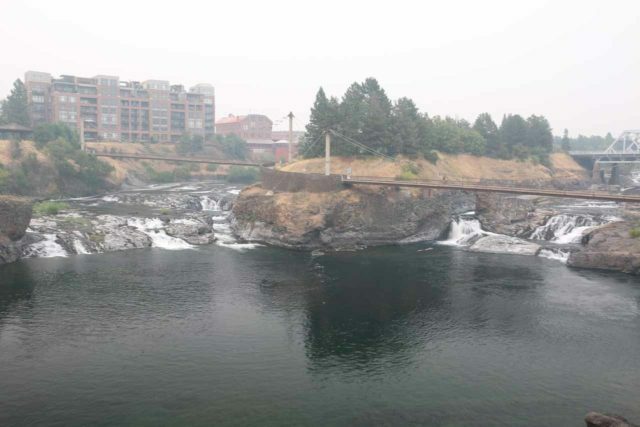 Once we made it through the thick smoke dominating Washington State (especially in the eastern parts of the state; preventing us from visiting Dry Falls along the way), we spent time visiting Spokane Falls and the mall nearby. This was another long day of driving as we cut northeast towards the Idaho Panhandle then east towards Whitefish. 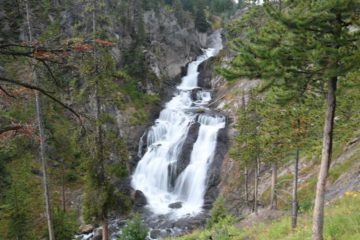 Along this drive, we passed through some scenic towns like Sandpoint (where the B-52s were performing that night though we didn’t stick around) as well as visited waterfalls like Moyie Falls and Kootenai Falls. 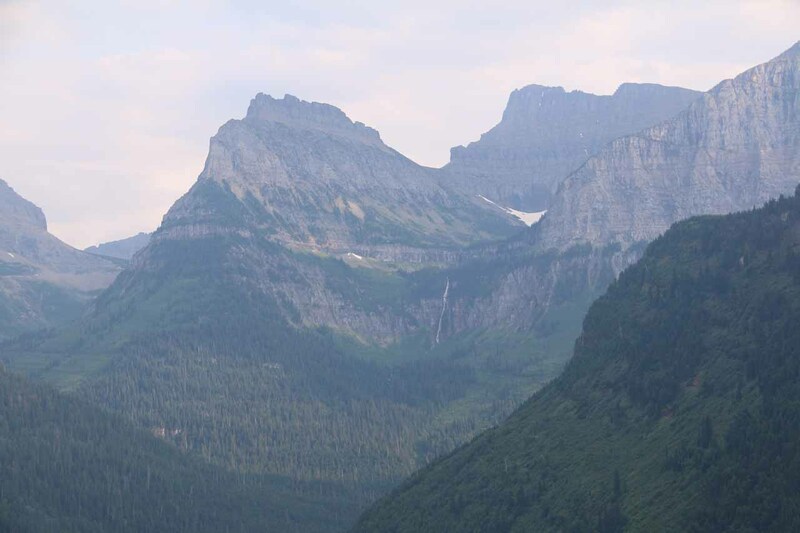 Towards the end of the day, I solo’ed a visit to Glacier National Park making it up to Logan Pass before returning back to Whitefish, where Julie and Tahia took a shuttle and toured the town on their own. During my recon to Glacier, I finally got to see the Bird Woman Falls, revisit Sacred Dancing Cascade, McDonald Falls, as well as watch the sun setting over Lake McDonald. On this day, we cut through Glacier National Park via the Going-to-the-Sun Road. 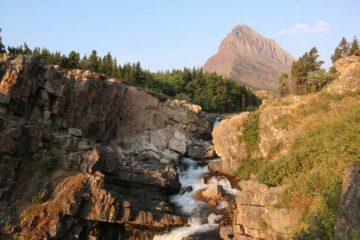 After a frustratingly futile search for parking at Logan Pass, we wound up parking a bit of a walk away from the St Mary Falls Shuttle Stop then caught an infrequent shuttle back up to Logan Pass. From there, we hiked to Hidden Lake and saw some cascades along the way. 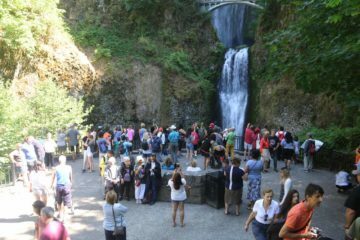 We then shuttled back down to the St Mary Falls stop, where I did the hike to Virginia Falls and St Mary Falls. 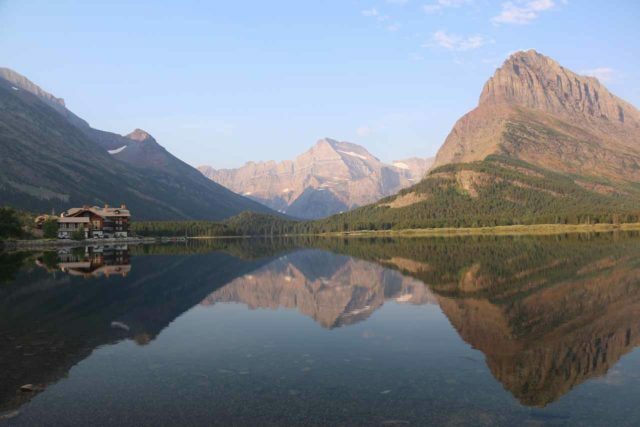 With an early morning start to ensure we would have parking and breakfast, we pretty much spent the whole day around the historic Many Glacier Hotel. 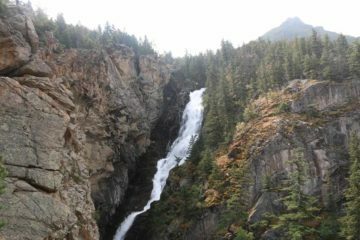 In addition to boat tours, I also did a long hike to the Grinnell Glacier seeing the Grinnell Falls along the way. 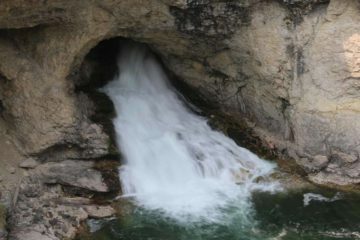 I also snuck in a pair of bonus visits to the Swiftcurrent Falls before the pop-up thunderstorms dumped their load in the late afternoon. 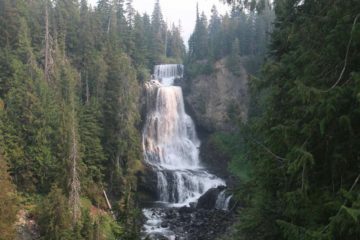 This was another long day of driving with a short break in the Two Medicine Valley picking huckleberries and hiking to a view of Appistoki Falls. 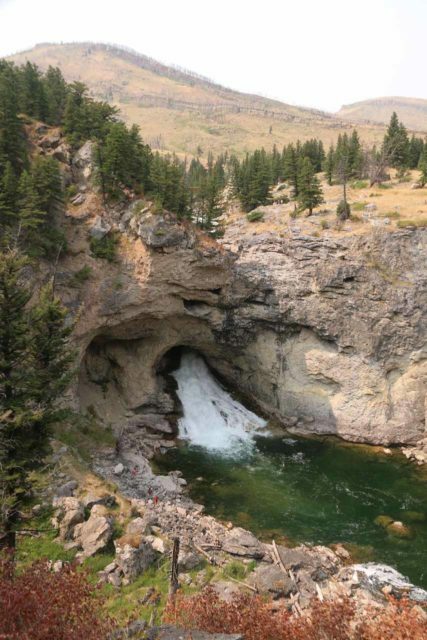 We then continued driving all the way to Bozeman via Helena before checking in. 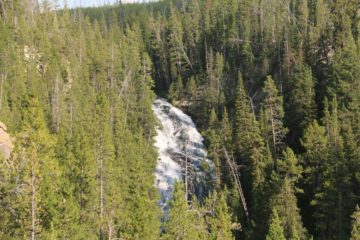 I then did a late afternoon out-and-back visit to the Ousel Falls near Big Sky. We did a day trip that began and ended in Bozeman. 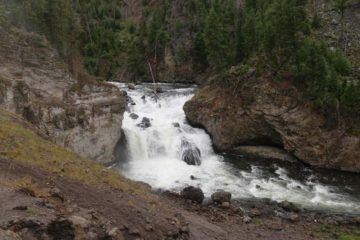 We began with a long drive out to Woodbine Falls then made a detour to Natural Bridge Falls before returning to Bozeman. This was a very busy day as we visited most of Yellowstone National Park’s well-touristed sites on our way to our accommodation in Flagg Ranch. 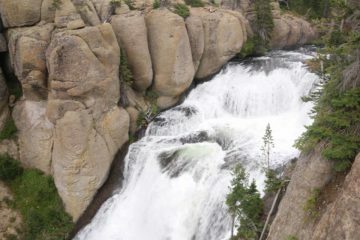 Along the way, we visited Undine Falls, , Lost Creek Falls, Lower Falls of the Yellowstone River, Gibbon Falls, Virginia Cascade, Hayden Valley, and Crecelius Cascade. 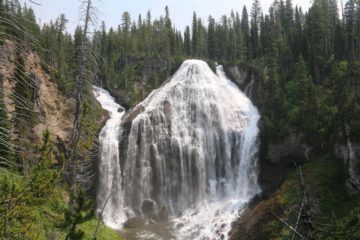 On this day, I went solo to do the Union Falls hike while Julie and Tahia went on a guided tour of Yellowstone’s familiar sights, including the brink of the Upper Falls. I also extended my hike by taking a dip in the geothermally heated Ousel Pool. I began this day with a sunrise photo shoot of Mormon Row then catching some early morning vistas of the Grand Teton skyline. Afterwards, I rejoined Julie and Tahia, and we then went to Jenny Lake to do the Hidden Falls hike. 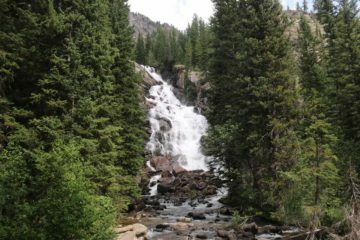 We then had lunch at the Jackson Lake Lodge, where we managed to get sweeping vistas that included the Wilderness and Columbine Falls. 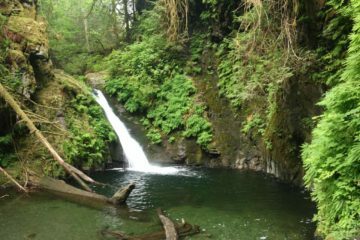 Then, after returning to Flagg Ranch, I went on another solo adventure to Terraced Falls before finding surprise waterfalls on Cascade Creek. 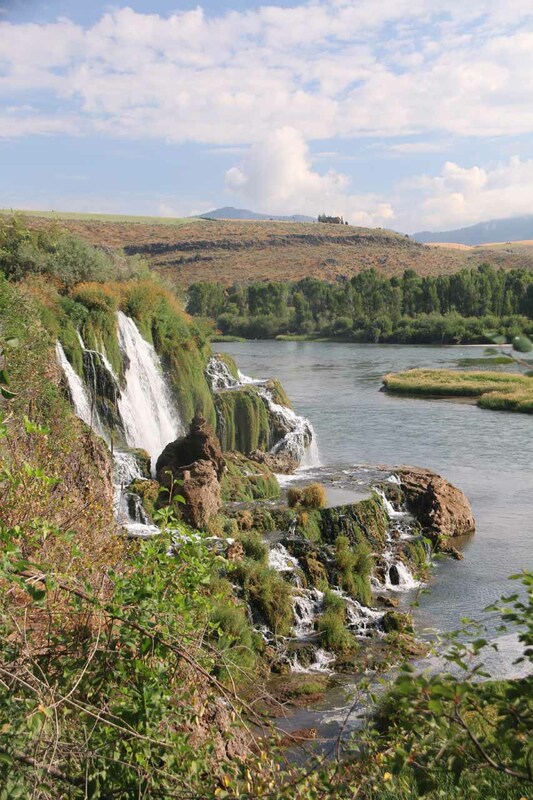 On this day, we made the long drive to Idaho Falls while visiting numerous sights along the way. 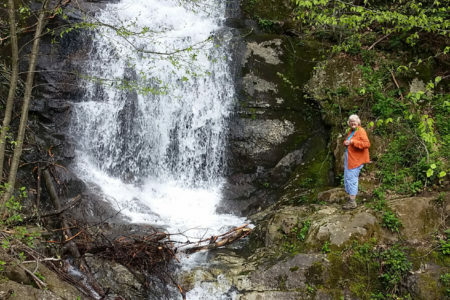 We started off with a stop at the Biscuit Basin where I did a solo hike encompassing Mystic Falls as well as the Biscuit Basin Overlook. 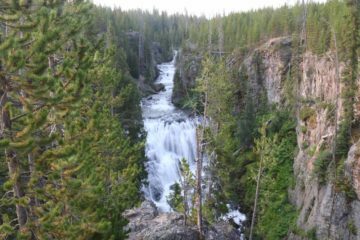 Then, we did the Firehole Canyon Drive, where we saw Firehole Falls and the Cascades of the Firehole, before spotting a bald eagle on our way out of Yellowstone. Next, we did the Mesa Falls Scenic Byway re-visiting Upper Mesa Falls and Lower Mesa Falls, then made a detour back into Yellowstone National Park to see Cave Falls just in time before a nasty thunderstorm overtook us. 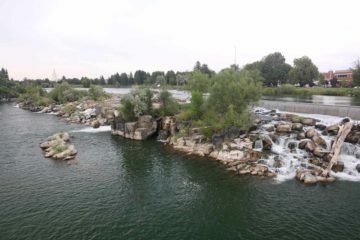 Finally, we arrived in Idaho Falls where we briefly checked out the man-made falls in town. 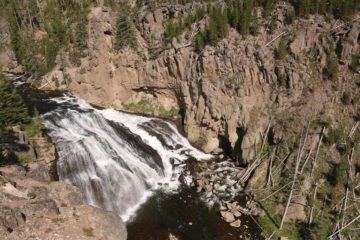 We started off the day with an out-and-back detour to see the Fall Creek Falls in Swan Valley before making the long drive to Boise. Once in Boise, we hung out with a good friend of Julie’s letting Tahia play with their kids. 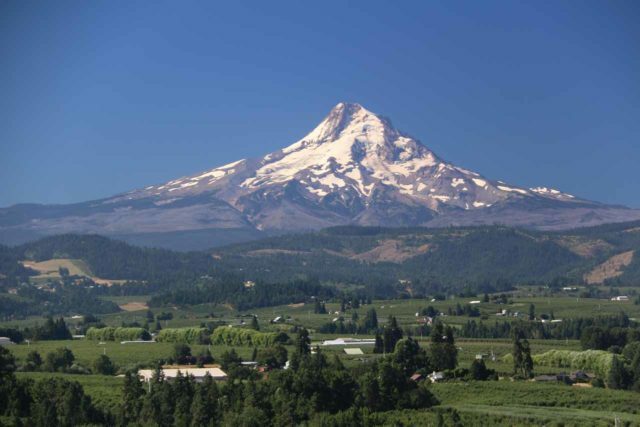 Most of the morning was spent making the long drive to Hood River then ultimately to Portland. 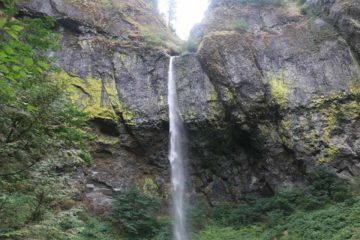 After leaving Hood River, we visited many waterfalls including Horsetail Falls, Multnomah Falls, and Latourell Falls. 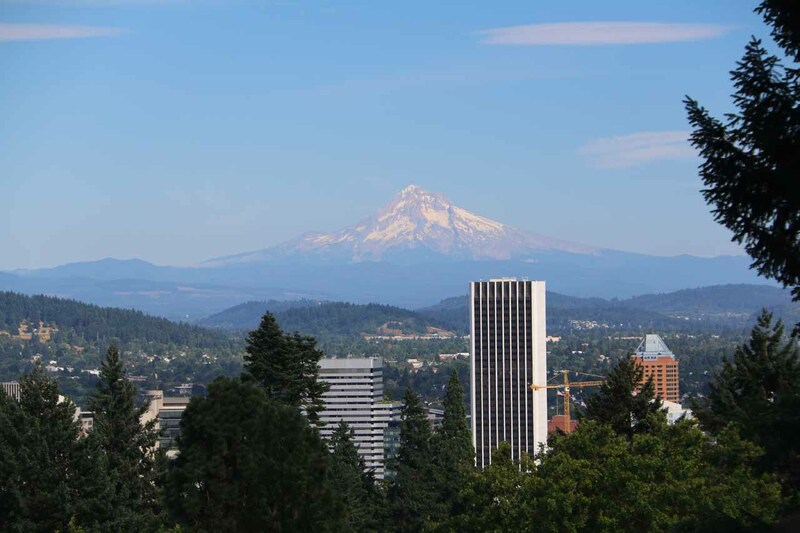 We then continued towards Portland by stopping by the Vista House and Council Crest Park before settling in downtown Portland. 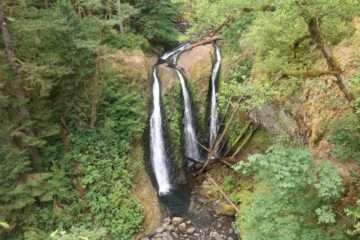 In the early morning, I solo’ed a pair of hikes to take in Triple Falls, Elowah Falls, and Upper McCord Creek Falls. 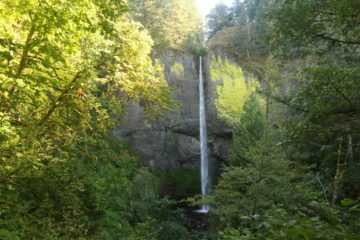 We then spent the better part of the afternoon visiting the Oregon Coast taking in Munson Creek Falls and Cannon Beach. 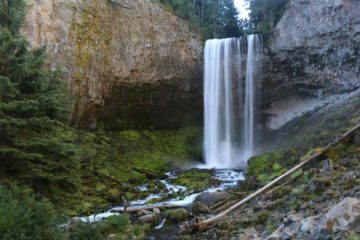 In the early morning, I solo’ed another pair of hikes to take in Tamanawas Falls and Punch Bowl Falls. Along the way, I enjoyed the vista of Mt Hood at Panorama Point Park in Hood River. The rest of the afternoon was spent visiting the Japanese Garden in downtown Portland before going on a foodie run to end off our last night in the city. 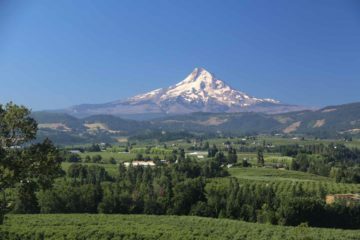 On this day we started the long drive back home. 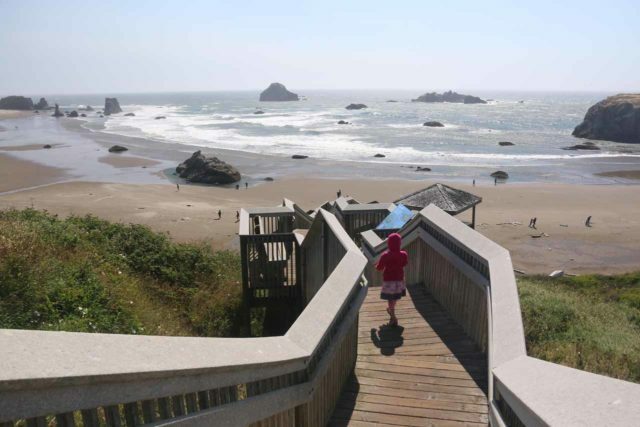 We first took a scenic detour taking in Bandon Beach before stopping over in Medford. 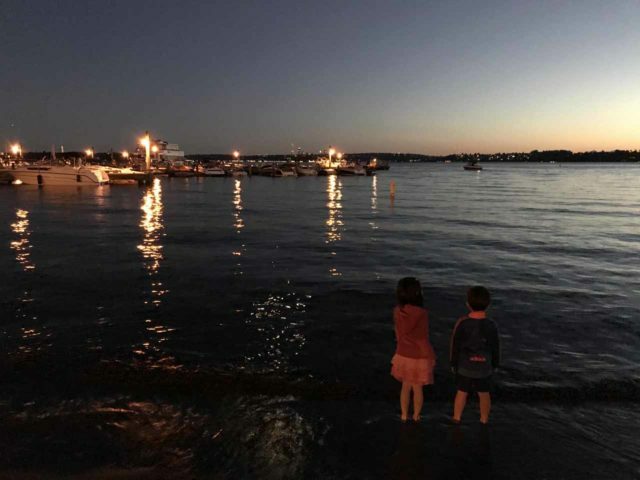 On this final day of our Summer Road Trip, we did the marathon drive from Medford all the way to Los Angeles. Carlton Plaza Best Western, Victoria – This historic accommodation was one of the few places that had the location, the full-sized kitchen, and the spaciousness to suit our needs. 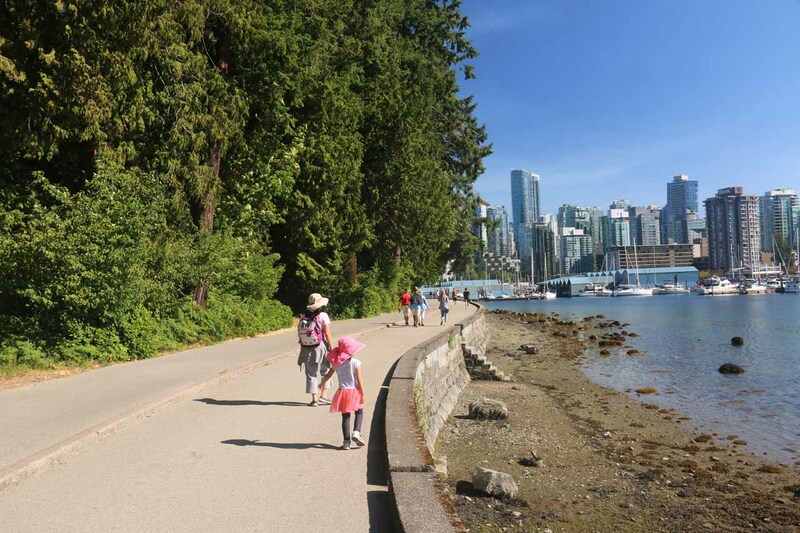 Location-wise, it was about a 15-minute walk along Government Rd to the scenic Victoria Harbour. Along this walk, there were happening pubs and restaurants as well as little snack shops like Bon Macarons, where we loaded up on tasty truffle-flavoured macarons. The only bad thing about this accommodation was the valet parking, which can be inconvenient if you happened to need the car immediately but didn’t bother to give them advanced warning. If this is the case, then it’d take around 15 minutes to finally recover the car (something we learned the hard way). 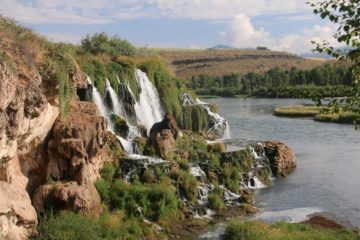 Residence Inn, Idaho Falls – Ever since Julie had issues with her gut, we’ve come to appreciate accommodations that are no hassle, consistent quality, and has a kitchen so we can better control our diet. To that end, the Residence Inn chain seemed to be the best in class when it came to this category (at least in our recent experiences both last year and this year). 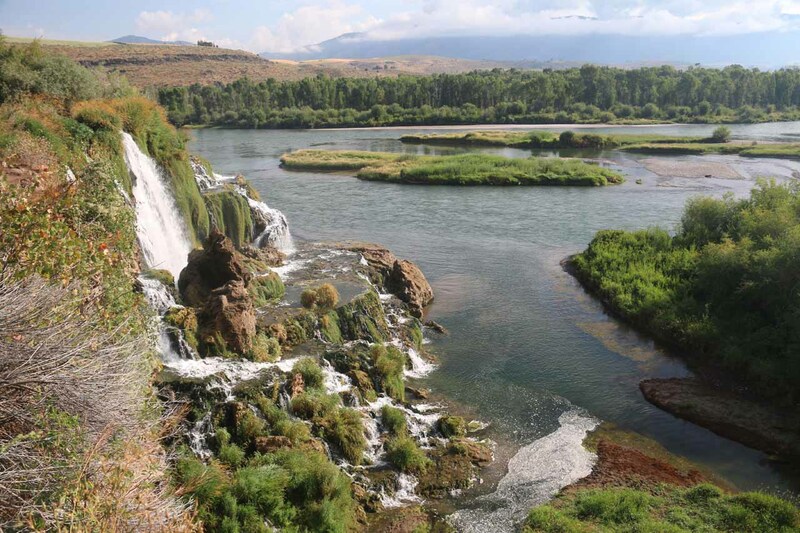 This particular accommodation was right by the park encompassing the namesake Idaho Falls waterfall as well as a Friendship Garden, which was a Japanese garden next to the Snake River. 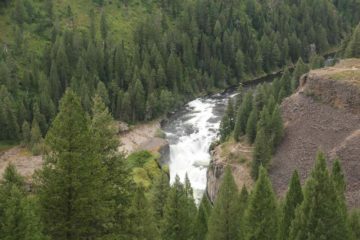 Headwaters Flagg Ranch Lodge – With this accommodation, it was more about the location than the amenities. We spent four nights here, but it was strategic in that we were close to the Bechler Backcountry Region of Yellowstone’s Cascade Corner, the Grand Tetons to the south, and many of Yellowstone’s famous sights like Old Faithful and Canyon to the north. 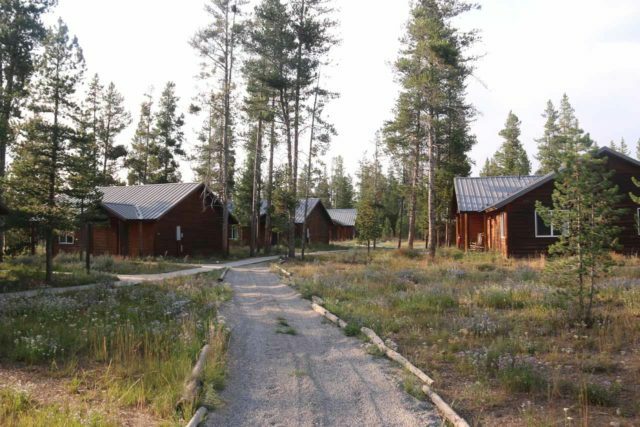 And while the cabins themselves were fairly basic, they were spacious, and the dining options in the main lobby were as good as you’re going to get in these parts as it happened to be the same concessioner as the one at the Jackson Lake Lodge (said to have the best food in the Yellowstone and Grand Tetons area). 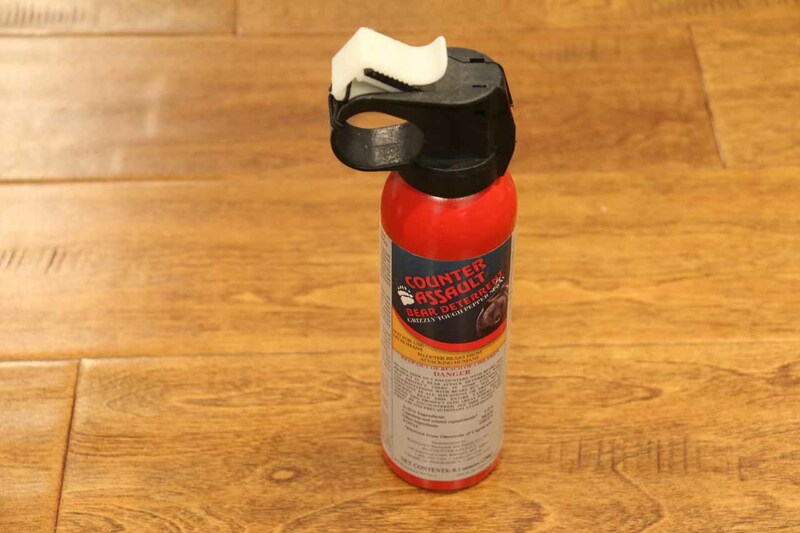 In addition to the equipment that we bring on all of our trips, we’ve also found the following items were especially useful for this particular trip. 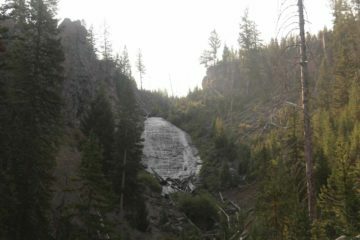 Hiking in Montana and Wyoming meant we were definitely in grizzly bear country. While there are things that can be done to minimize the likelihood of bear attacks, having bear spray on you is a good last resort. 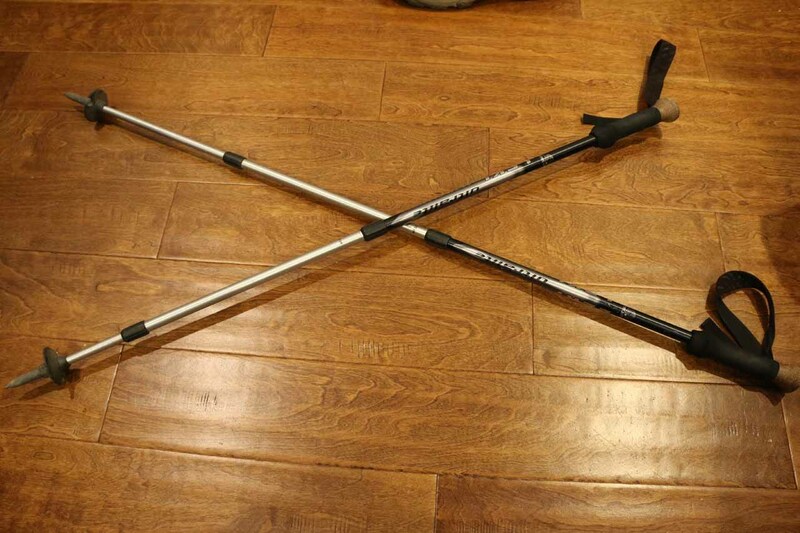 Just about everyone I saw in the backcountry had one of these, and I made sure to carry one around as well. 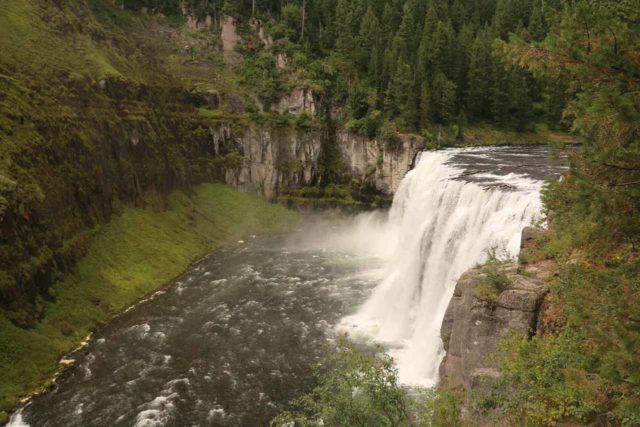 Now, I did notice that the National Park Service had these for rent, which might be a good alternative to paying around $50 for a can that doesn’t get used that frequently. Nonetheless, I did wind up buying my own since you do have to queue up to rent one (at least from what I’ve seen). 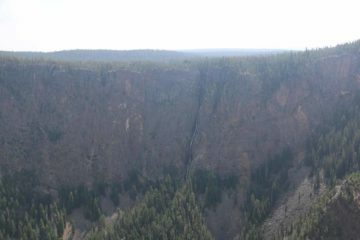 Finally, one thing to be wary of is bear bells . 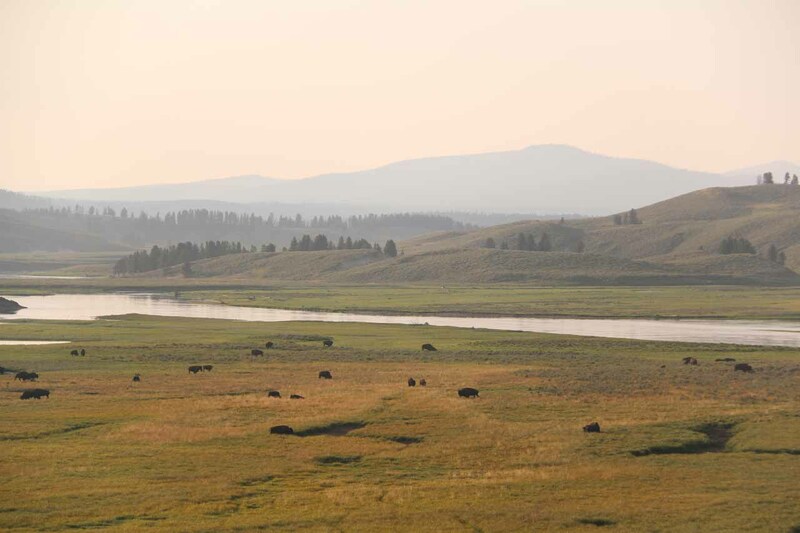 We’ve been informed by rangers that bears are smart enough to associate bear bells with packs carrying food. 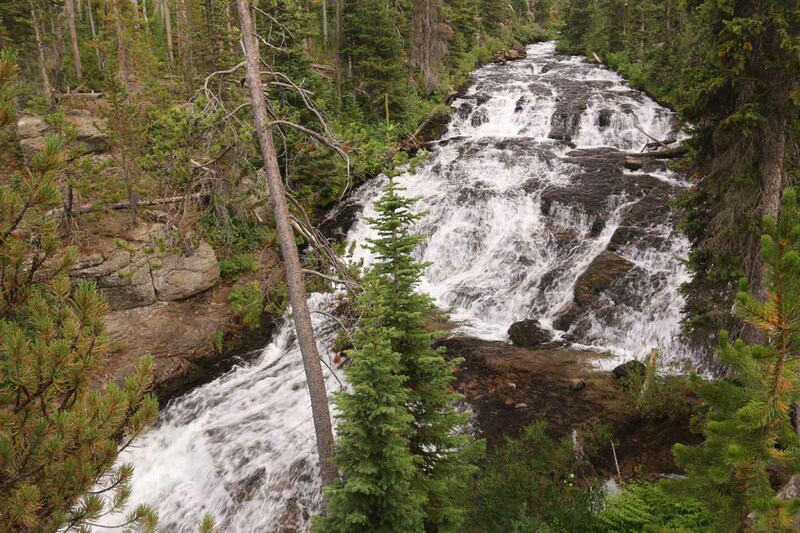 Therefore, bear bells act like dinner bells resulting in an increased chance of a grizzly encounter. 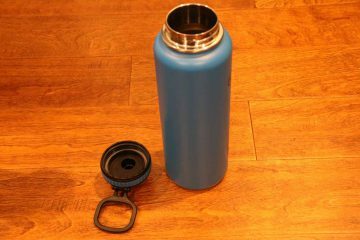 Even though this item was already in our essentials list, I’m reiterating these bottles here because it was especially useful in the National Parks where shops had clean dispensers to fill up a bottle with water. 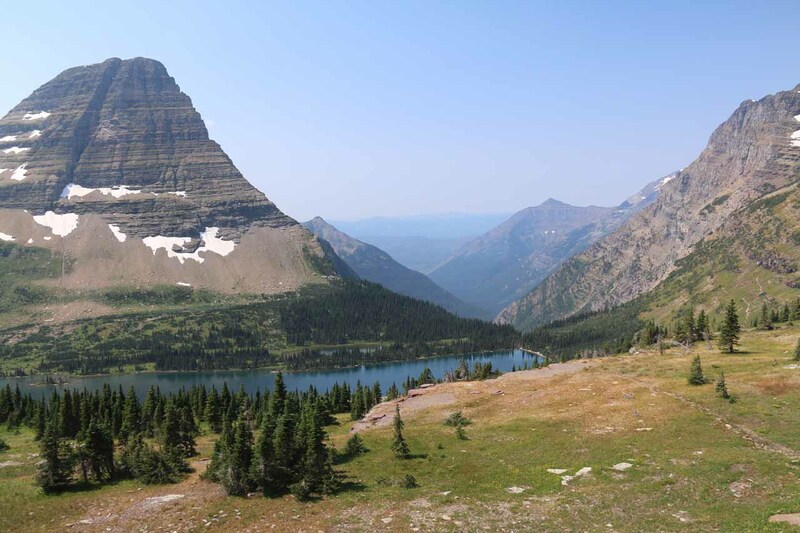 We made good use of these in both Glacier and Yellowstone National Parks and it dramatically reduced the need to fill the world with more plastics as well as helped us to save some money in the process. 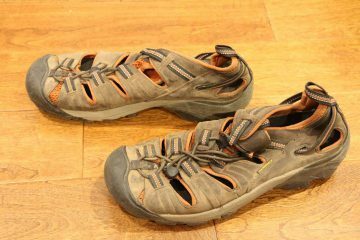 Water shoes or shoes that can get wet was definitely one piece of essential equipment that I needed for my Union Falls hike. 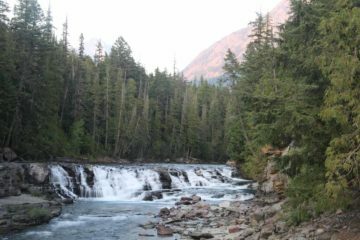 I specifically brought my Keens for this purpose since the Union Falls hike required one long river crossing and another stream crossing that was deep enough to ruin a good pair of boots. 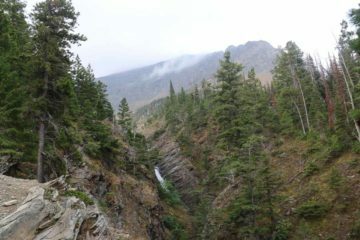 So in my mind, it was worth carrying the extra weight to negotiate such situations, especially since a good pair of hiking boots aren’t cheap. 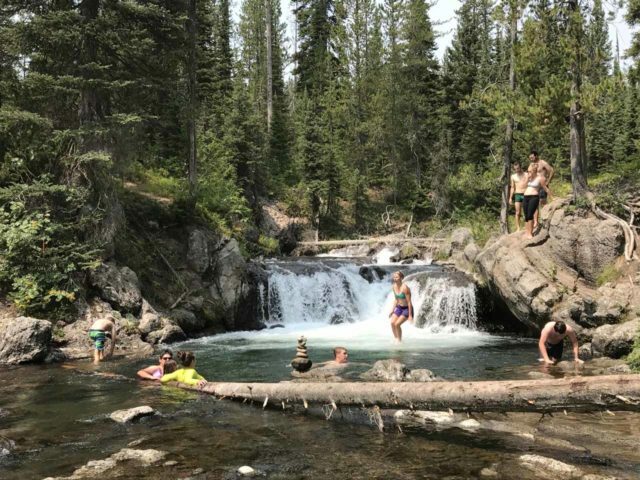 While on the topic of river crossings, I found that having trekking poles definitely helped to maintain balance, especially in spots where there was enough of a current to potentially knock me over and really damage things like my camera (from getting dunked in water). 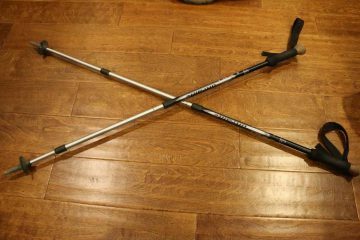 Generally, I find carrying these poles can be burdensome, but there are situations like the river crossings and possible wildlife encounters among others, where they’re useful. I also carry them around if I’m on an overnight backpack hike to try to lessen the burden on my knees though I didn’t do such a hike on this trip.